for year 8. yes, I can't believe it either. that I've spent that much time in the Black Rock Desert - that much energy hauling myself and my clothes back and forth to this desolate place. There are the gorgeous sunsets, the quiet, the noise, the friends, the family by now, the Post Office where I participate in a kind of improv theater that has probably done more to spice up my life than anything before... and it all begins for me tomorrow with a turn of a key in a starter. Ah, so simple. Goodbye work. Goodbye BlueOregon. Goodbye Daily Kos - for a brief 10 days which will pass too quickly and then all of it will come rushing back. This year should be interesting. They've been having dust storms and wind storms like noone's seen in years. Seems the lake that usually fills the area in the Winter never developed this year and so it's a big dusty mess out there. One year it was a big dusty mess - I don't ever remember smiling so much. This year's theme is Greening the Man and there will be all sorts of carbon balancing, trading - and camps are being encouraged to go above and beyond to be green - though we've had a LNT - Leave no Trace, ethic at this event for years. And, it's more political than one might think. And very smart. I've never been around such a big bunch of smart, thinking people before - feels very supportive and interesting in that way. May the general trend towards righting the ship of state continue while we're all out there finding ourselves. Power to the Peaceful! Nice! 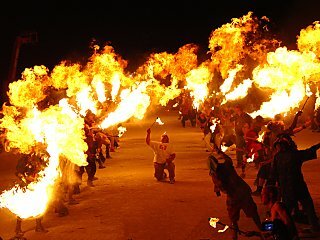 I've been to Burning Man once; best vacation I've ever had. Have fun! I shared a panel discussion at Horning's Hideout last month with the guy behind Cooling Man.org. The aim is to make Black Rock the first carbon NEGATIVE city in the world. Very cool, pun intended! 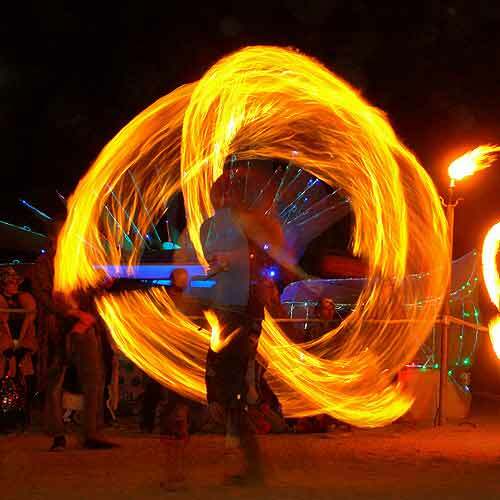 Burning Man sounds a lot like the Country Fair with less children and naked hairy people. Dude. This is not burning man time, it's Hood to Coast time. Yee Hah! Twice was enough for me. When the overlords of the Temporary Autonomous Zone decreed that we could no longer carry Empty guns (which were subject to inspection at any time), my participation in the Disgruntled Postal Workers lost it's luster. Yeah, I just love all those freedom lovers that like to pick and choose from the bill of rights! Safe travels and have all kinds of fun! If you see a giant effigy of Ginger Rogers, that belongs to my friend Scott. Stop and say hi!